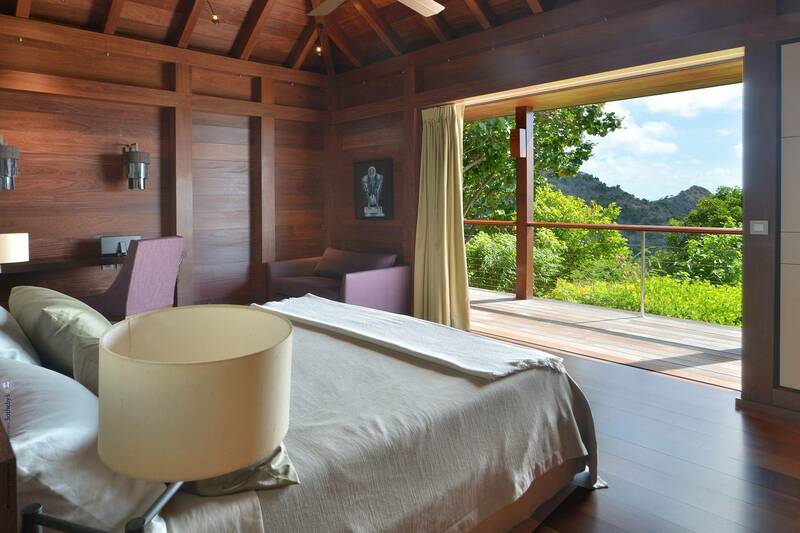 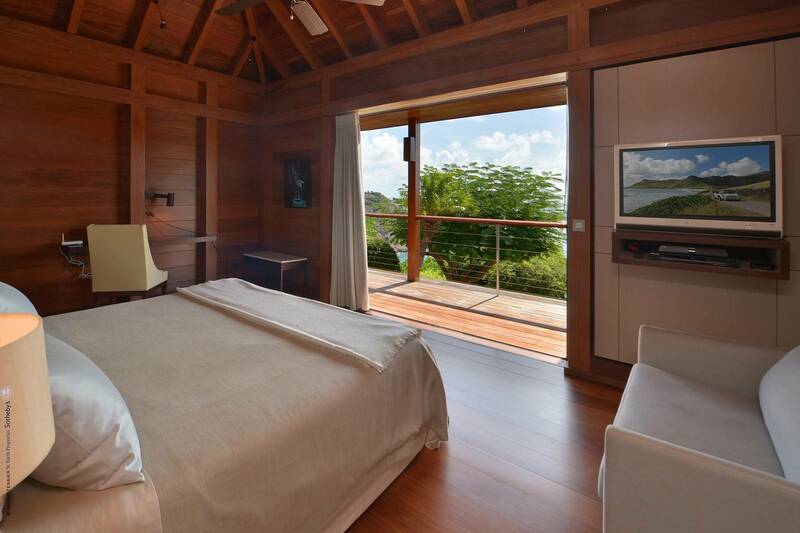 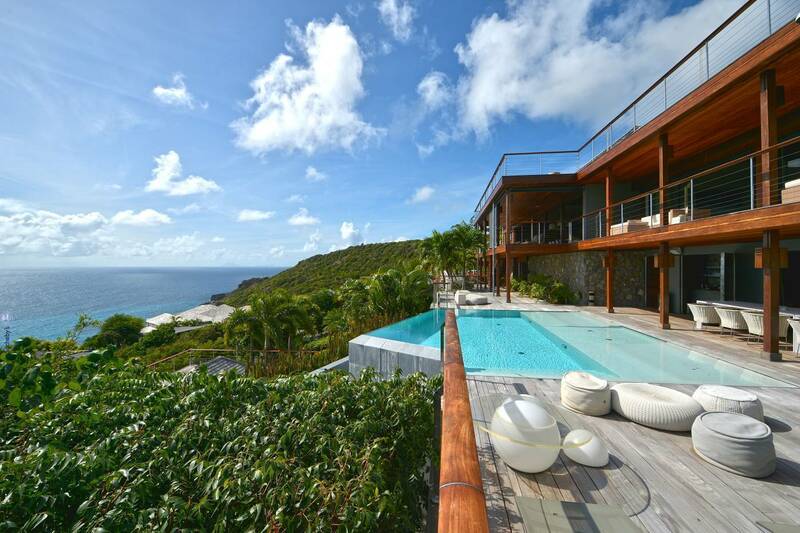 Dream About: A 6 bedroom villa as gorgeous as its view of Gouverneur and the sea beyond. 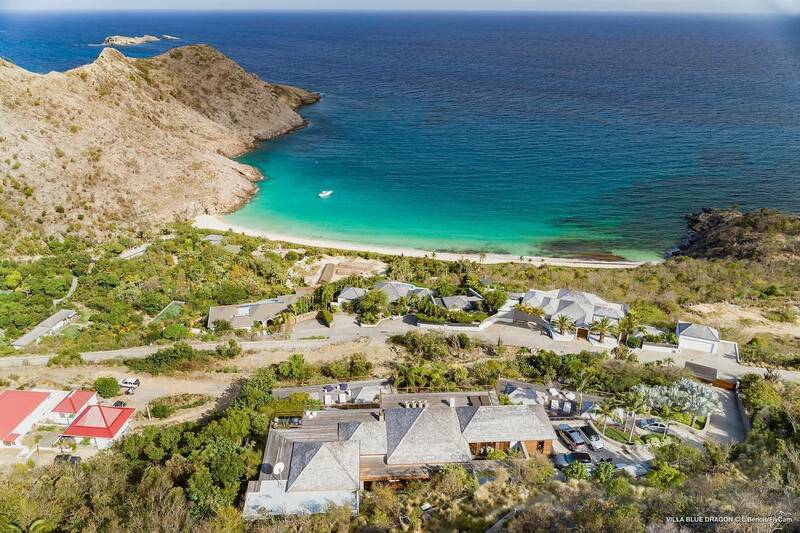 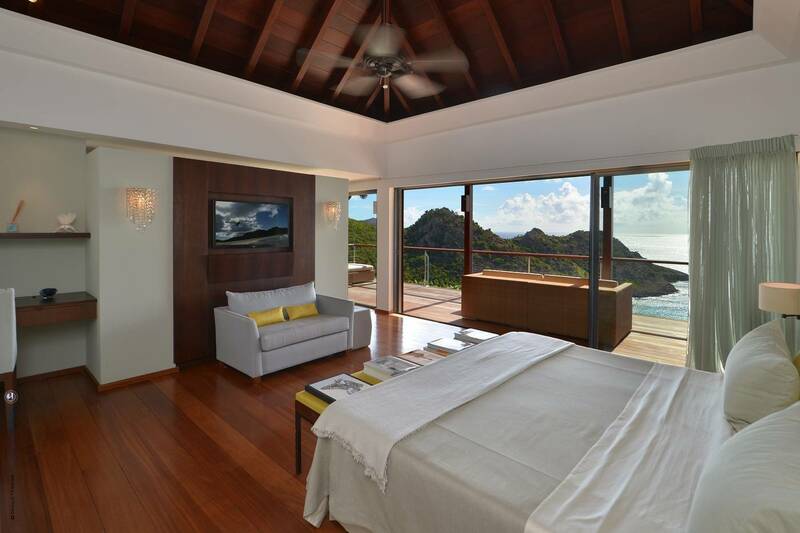 Poised above Gouverneur Beach, the dramatic view from Villa Lyra is as stunning as the villa itself. 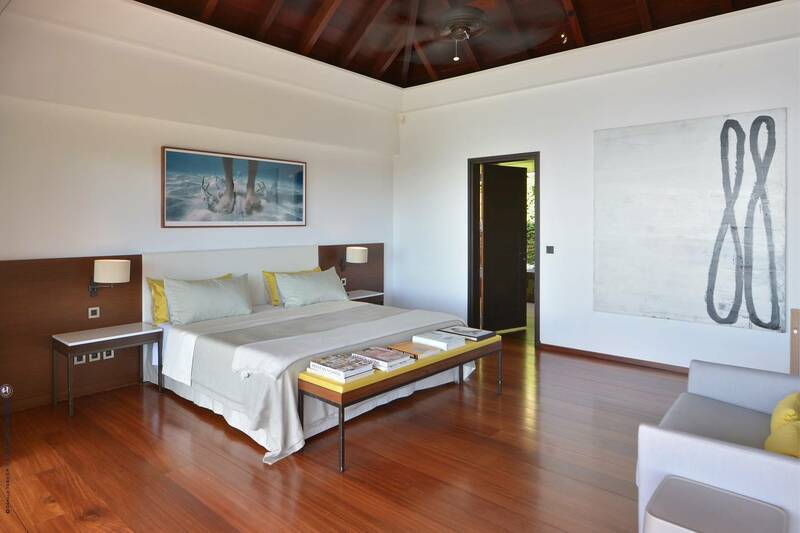 Contemporary in design and décor, it’s configured over several levels with 6 bedrooms (all en suite, with king beds). 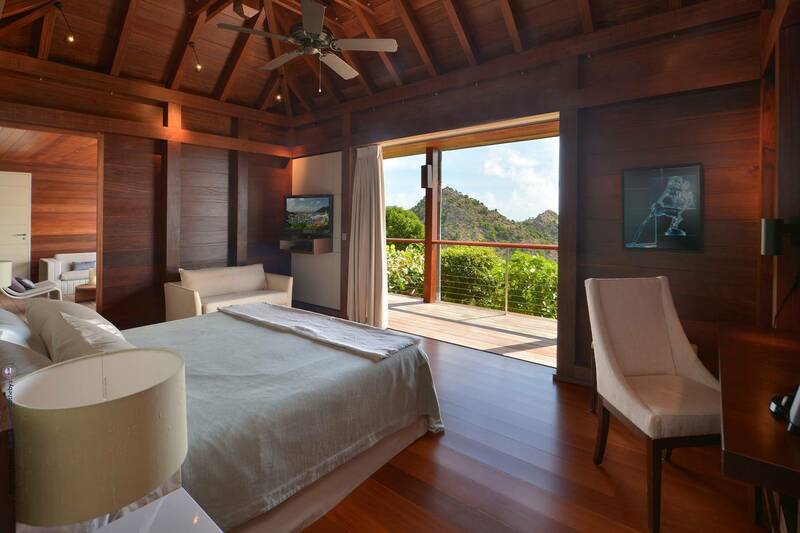 Rich dark wood floors and louvered shutters add a traditional touch and complement the light neutral palette. 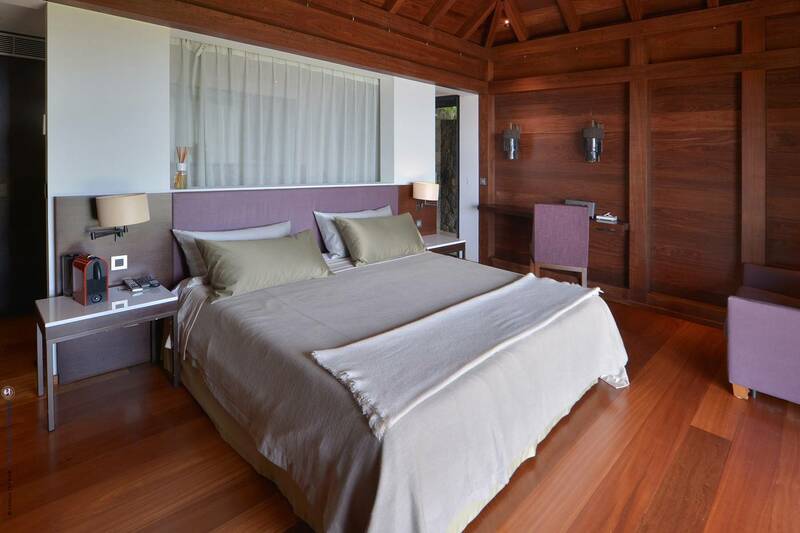 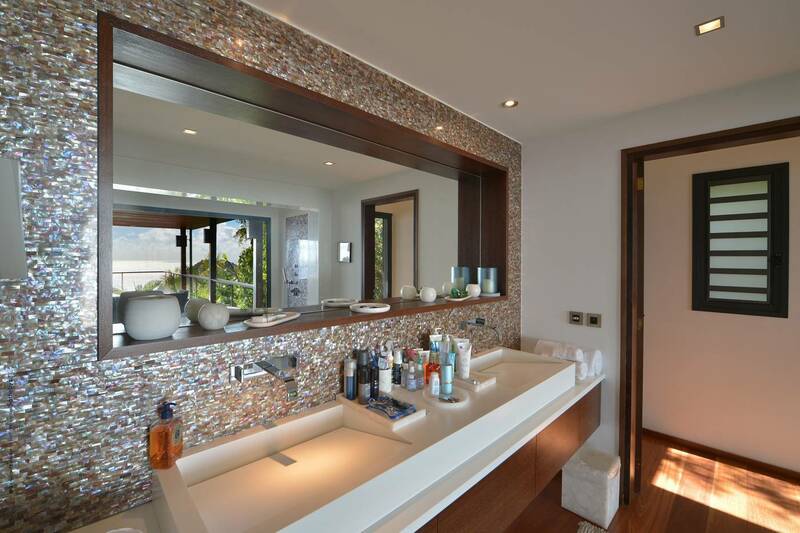 Guests can gather and share the villa’s amenities, and enjoy private quiet spaces and moments. 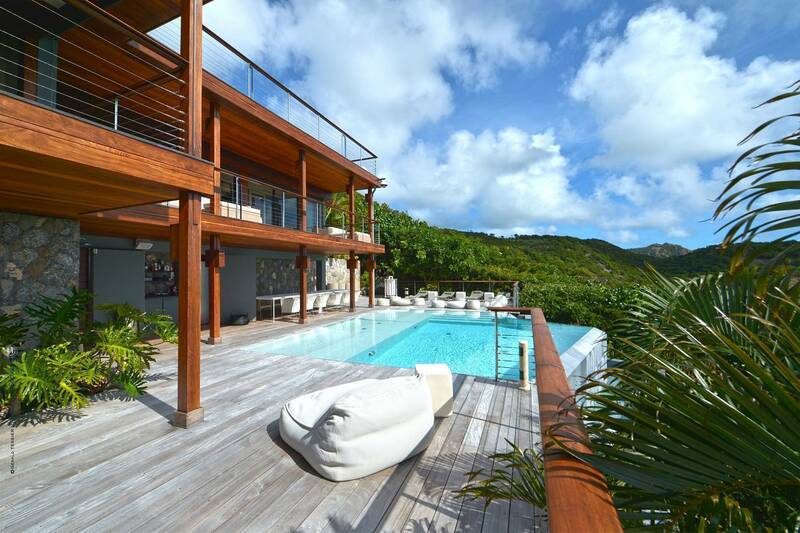 The heated infinity pool is the focal point of an expansive deck furnished for vacation-mode outdoor living and dining – complete with a sound system. 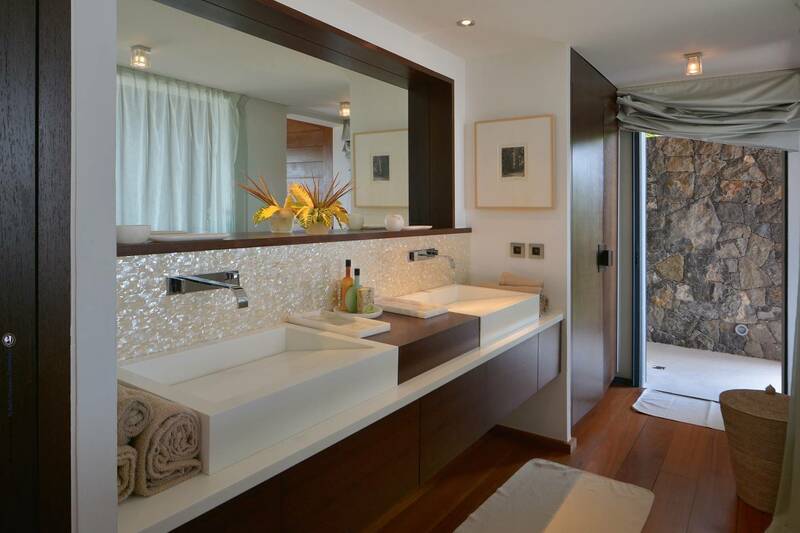 A guest bath and an outdoor shower are conveniently situated especially for those coming up from the beach. 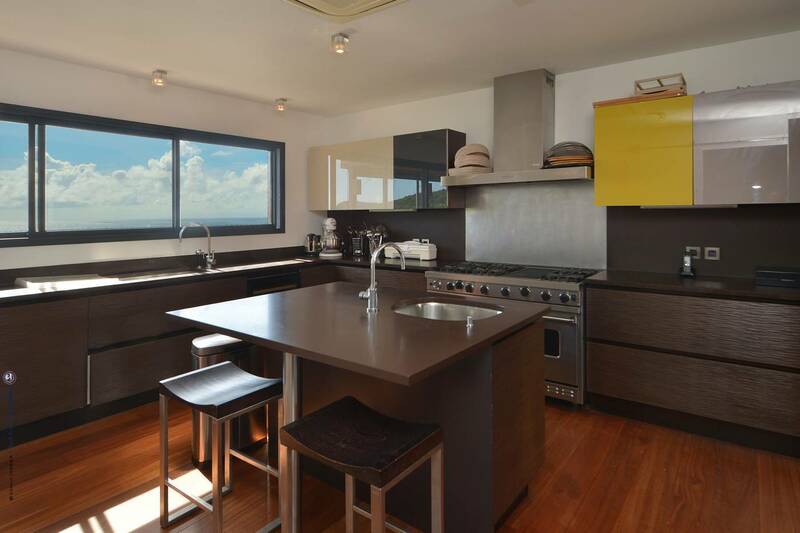 A kitchenette with a gas grill facilitates the fun of poolside BBQs. 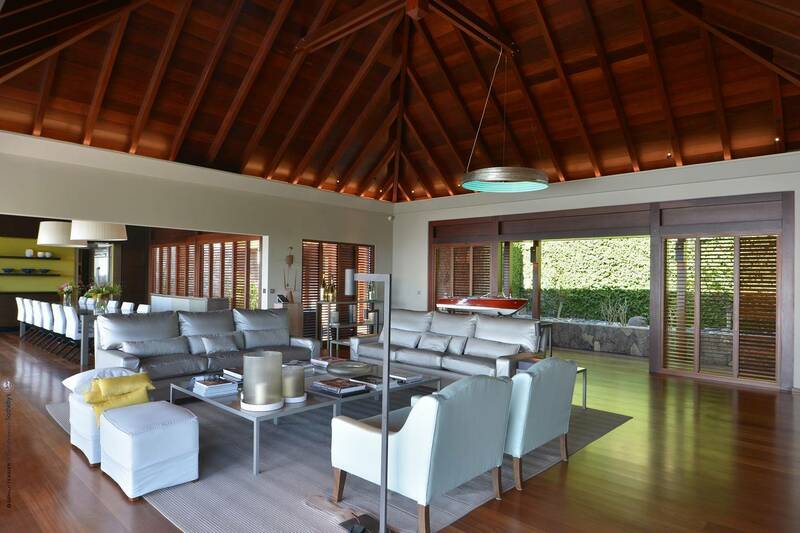 Indoors, a spacious comfortable living room is perfect for conversation and feet-up TV viewing, and a dining area. 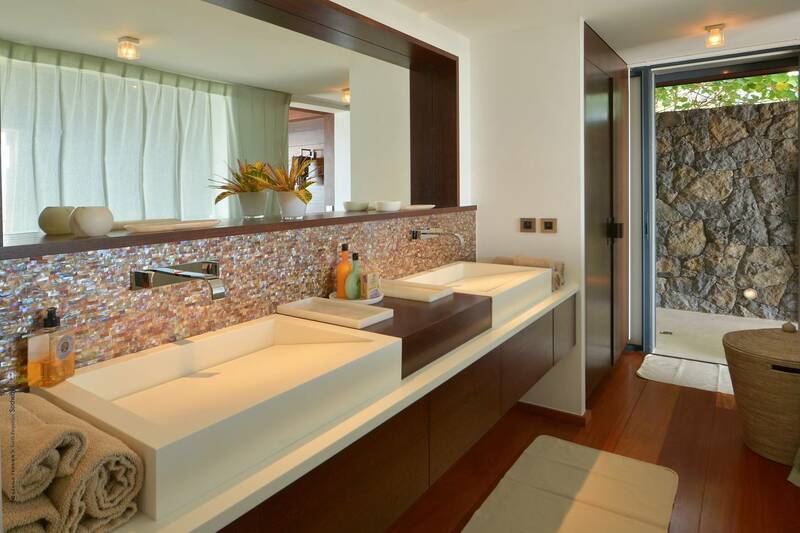 A second guest bath is on this level. 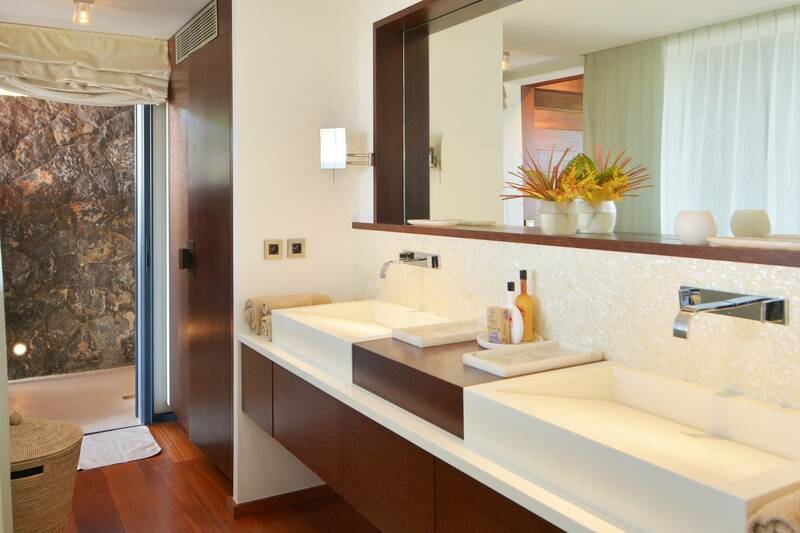 A well-equipped (fit for a chef) kitchen has a cold room for storage; private chef services can be arranged for all, or a portion of the stay through our concierge team. 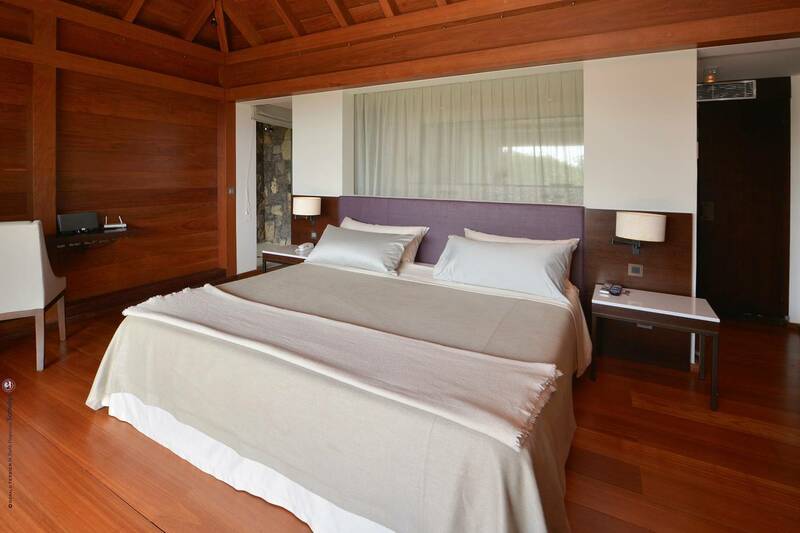 Two bedrooms are in the main house. 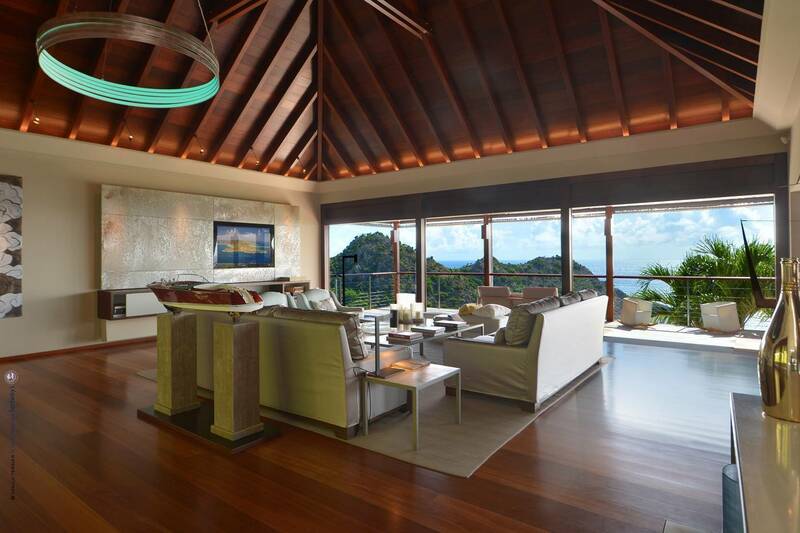 One, off the living area, has a private terrace. 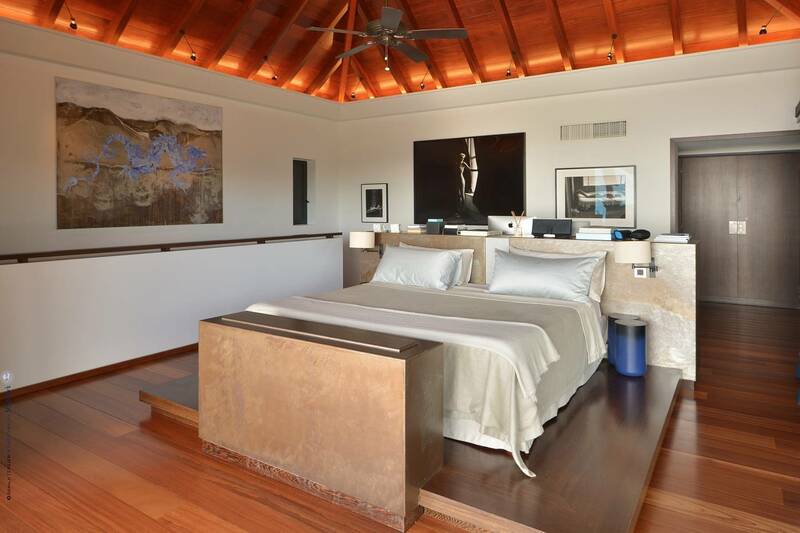 The master suite is upstairs and includes an office area. 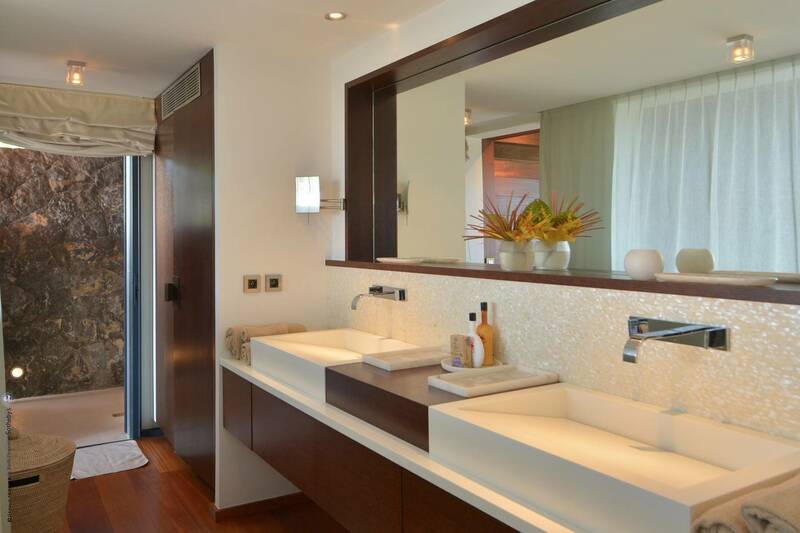 It features a walk-in closet, a dressing area and en suite bath with indoor and outdoor rainhead showers. 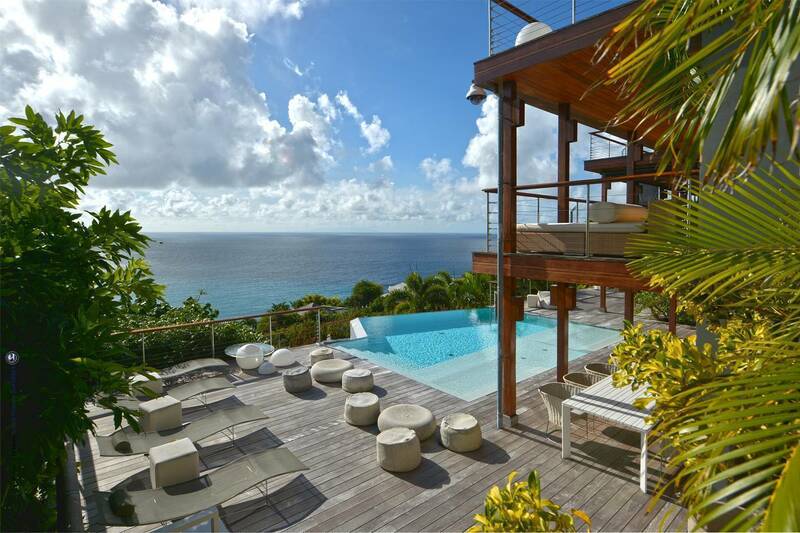 Its wraparound deck offers sun, shade, and an incredible view. 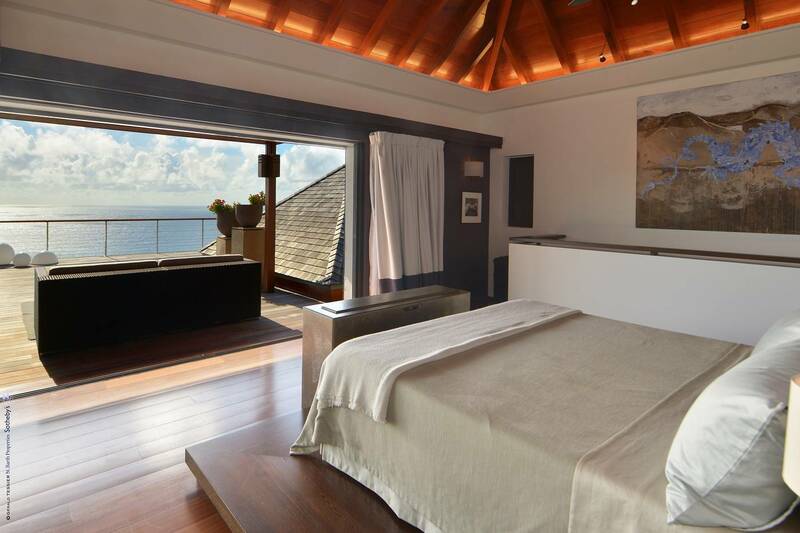 Four identical guest rooms are housed in two lower-level, separate pavilions, each of which features an outdoor shower with a view. 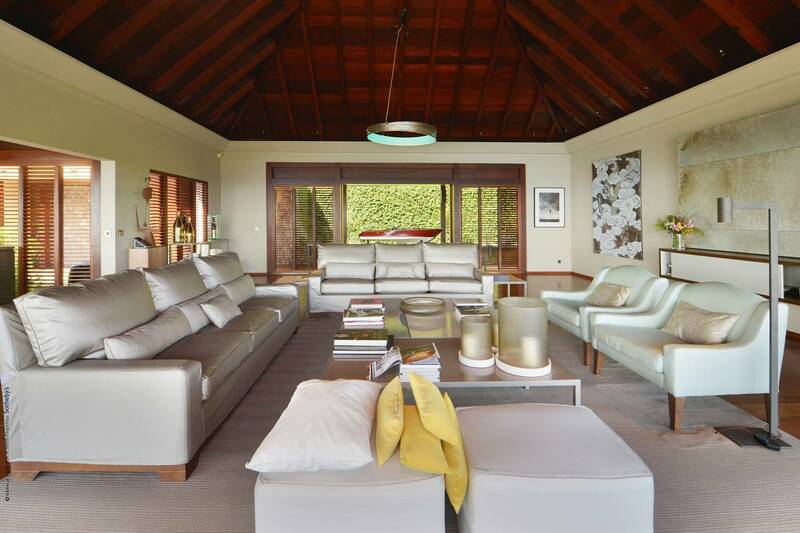 They share an outdoor living area and a kitchenette. 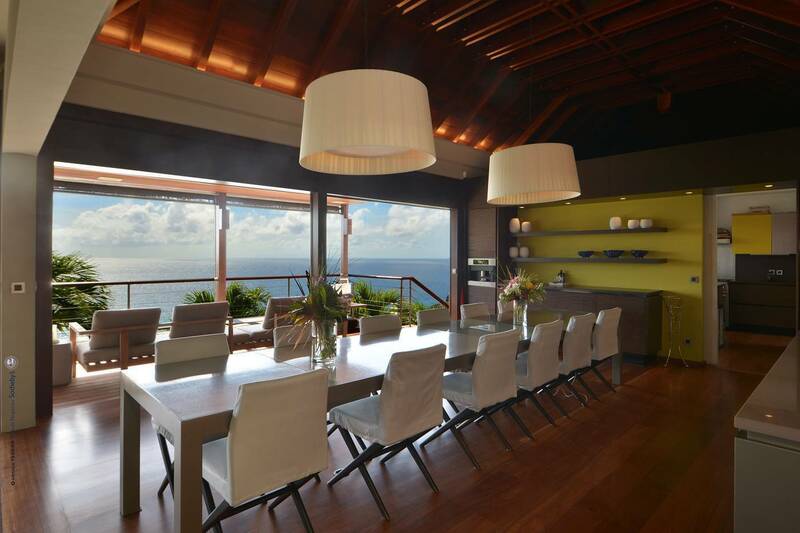 Each boasts a view of the sea. 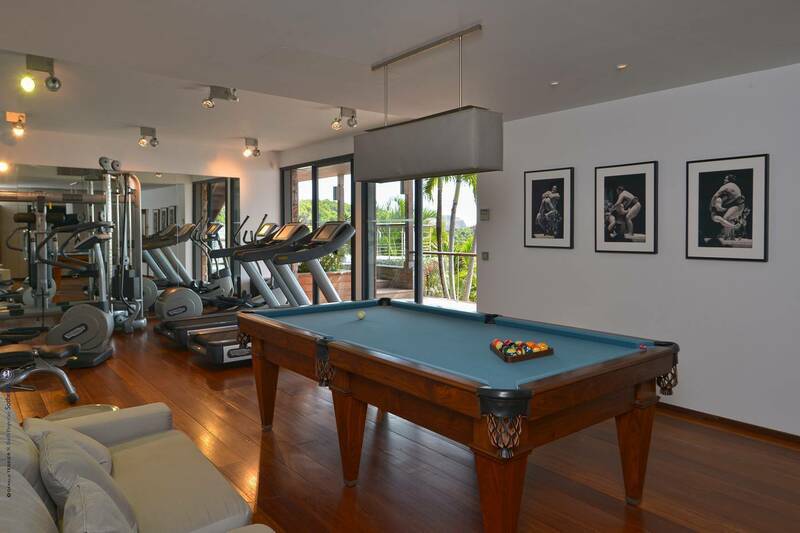 Additional features include an air-conditioned fitness room with a billiard table. 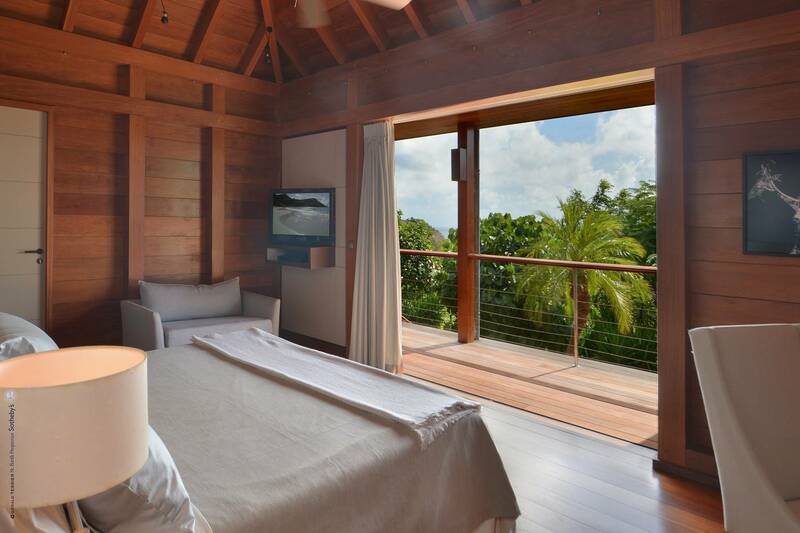 TVs throughout, including in the bedrooms, have US and French satellite TV and Apple TV. 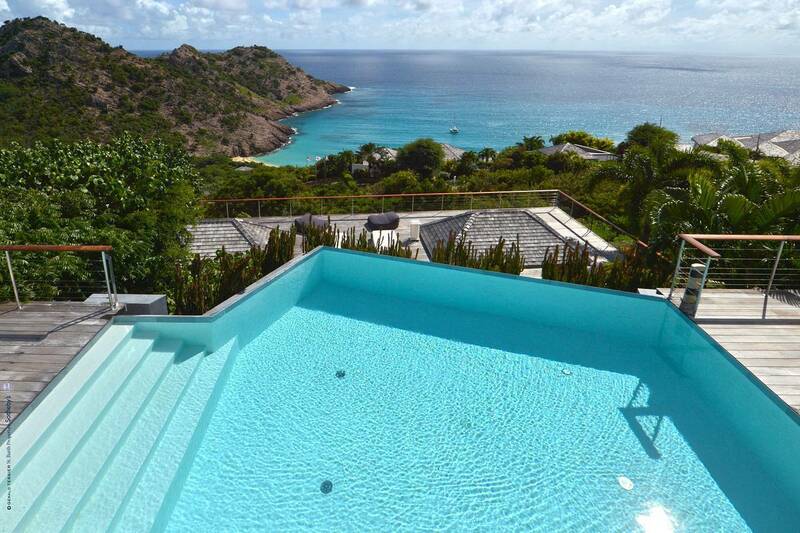 Guests love being just "up the hill" from gorgeous Gouverneur Beach, and proximity to Gustavia’s shops, restaurants, and its iconic harbor. 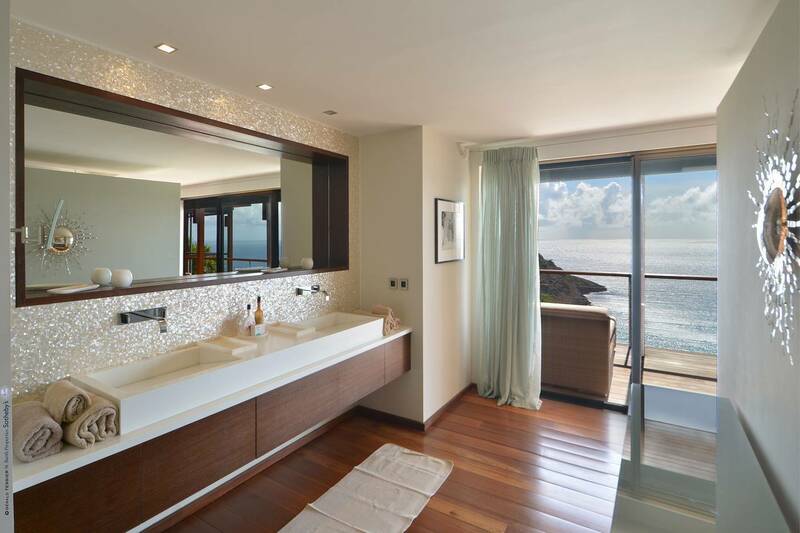 Part of St. Barth Properties exclusive Grand Cru Collection that provides for extra amenities and services including a morning delivery of French pastries, light laundry (no ironing) and evening turndown service 7 days per week. . 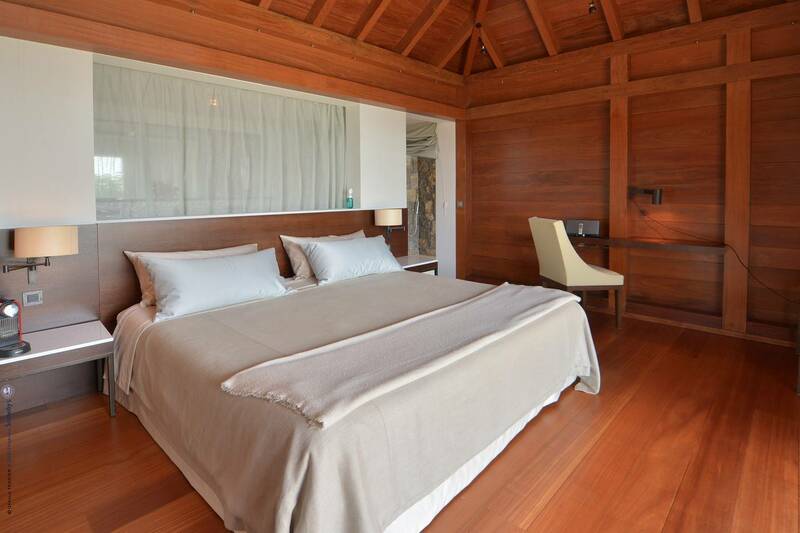 The master suite with a wraparound deck. 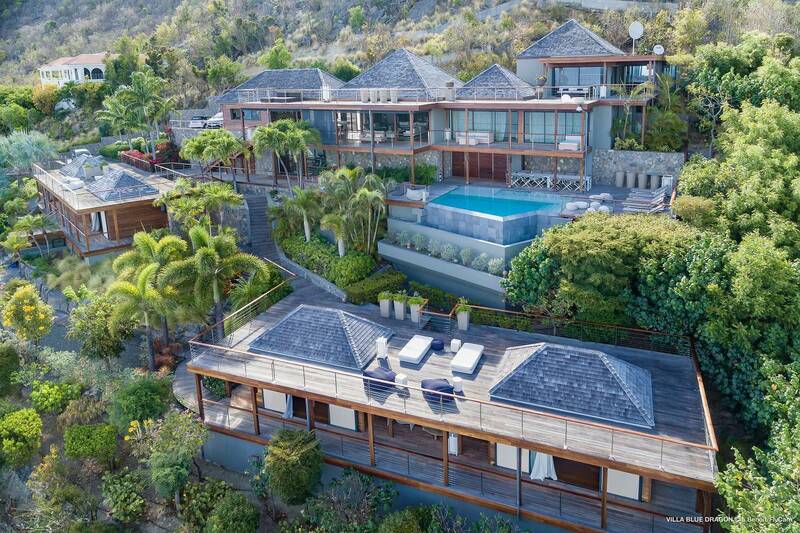 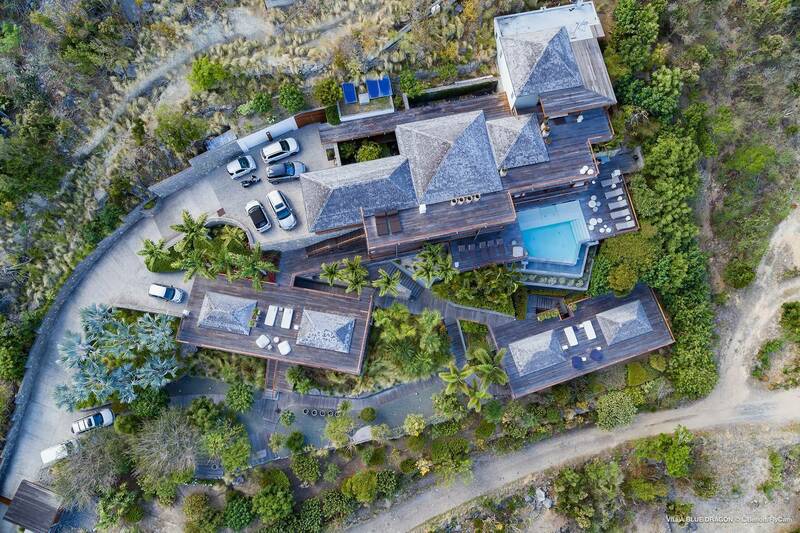 An expansive deck, heated infinity pool; main house has chef’s kitchen, master and guest bedrooms; 4 en suite bedrooms in 2 pavilions; fitness room.